Beautify the Halsey Stop this Weekend! Children signing up to volunteer. All images courtesy of Moira Willams. Would you like to put your green thumb to good use, take part in a wonderful sidewalk mural, or just simply do some good for the community? If you answered 'yes' then I have the perfect Sunday plans for you! 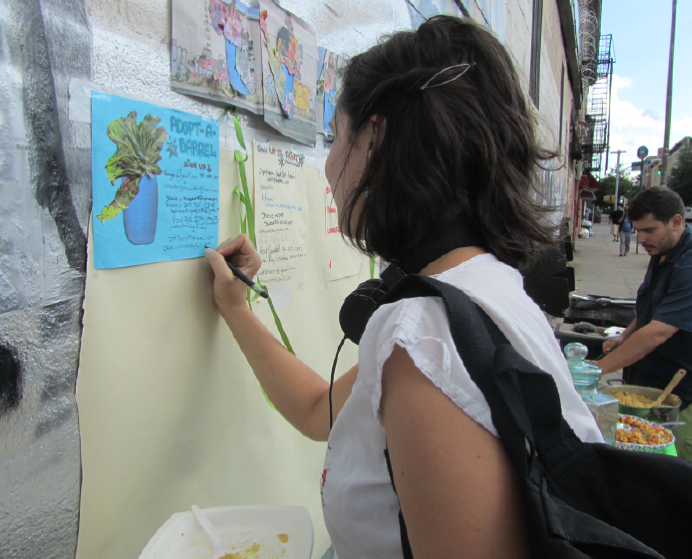 This Sunday, September 15, 2-6PM at Halsey St. (between Wyckoff and Irving Aves, on the same block as the L Halsey stop) you can join The Halsey Street Greenway and Sidewalk School for Everybody Projects' efforts to make Bushwick a beautiful place to live! 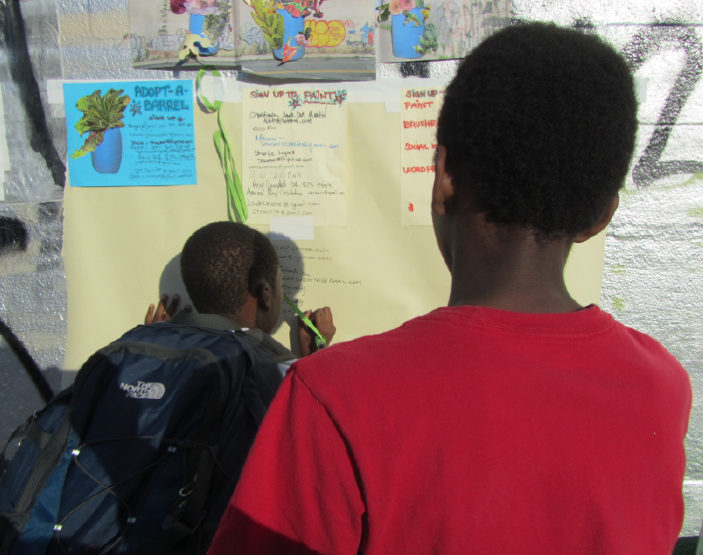 Headed by Moira Williams, Halsey Street Greenway and Sidewalk School for Everybody is a community partnership with the aim to "create presence in an unsafe subway exit and walkway on Halsey Street." Plans for the Halsey Street Greenway include "Adopt-a-Box" planter boxes to be adopted by community members and planted alongside the 600-foot-long outer wall of the Jonathan Adler warehouse. Benches and trellises are also expected to be installed along the walkway and tiles will be mosaicked into the sidewalk cracks that will direct people to various public green places such as Irving Square and Eldert St. Community Garden. Williams is also planning to include a mural, which will be created collectively by the community. Sounds great to us! See you on Sunday!